Discussion in 'Disney's Animal Kingdom' started by Cole, Apr 19, 2014. For those who have not seen it.. I don't think it'd be too bad if the bodysuit the actor was wearing was camouflaged in some way. It's still not the optimal design, but it'd be a lot better. 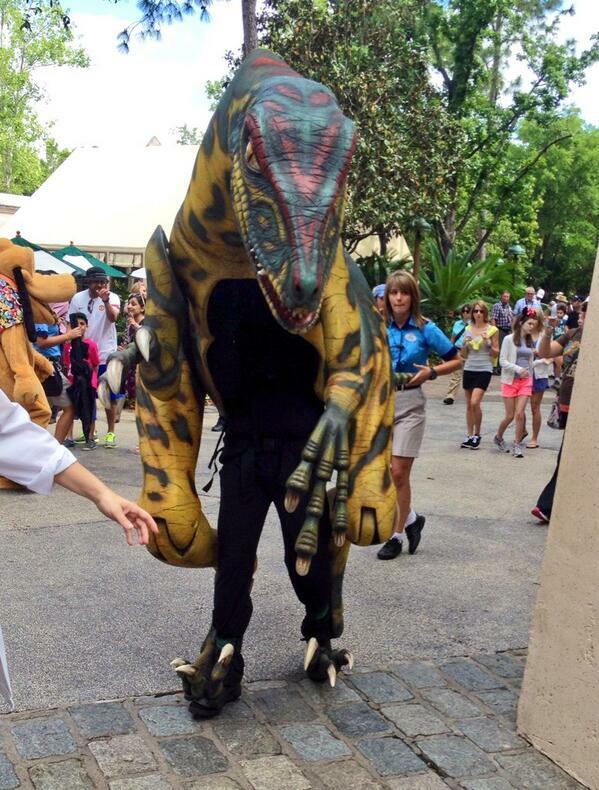 Still, the fact that DAK has a velociraptor character before IoA does is sad. These ones are so much cooler looking, but maybe too scary? There's a way to adopt the current costume, add a chest plate, a better color for the full body suit, etc. What's the story they are using for this thing when they bring it out? Is the "scientist" trying to pass it off as a real dinosaur, or is it just "shown" as a prop to demonstrate what a dinosaur would be like? I mean either way it doesn't look very good. But if they're trying to say, "look, a living breathing dinosaur in the flesh", then they're wayyy off base. They should at least try and hide the knee and neck connection points with some sort of "skin". 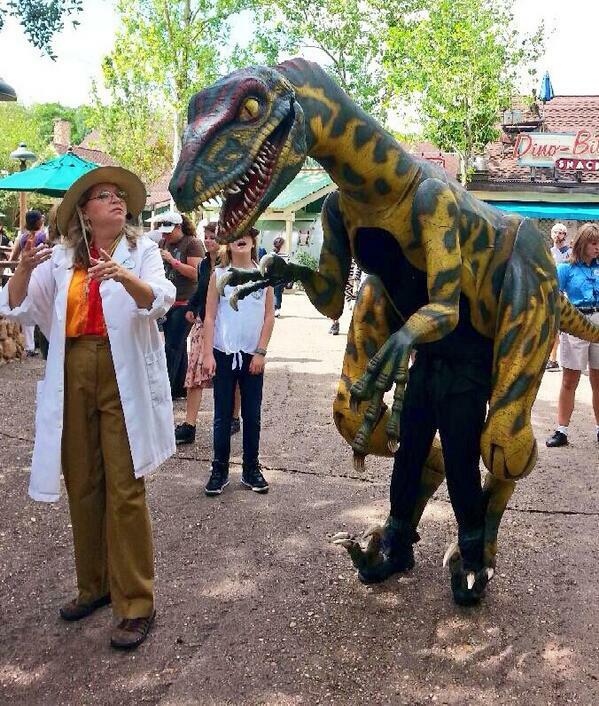 "Beginning April 19, Disney’s Animal Kingdom Theme Park will be conducting a test of a new atmosphere entertainment offering in DinoLand, U.S.A. Several times a day, Guests visiting Animal Kingdom may encounter Professor Parker Woodson from the Dino Institute, along with his velociraptor, affectionately named “V,” as they embark on a “Jurassic jaunt” through DinoLand, U.S.A. Professor Woodson has hand raised “V” from birth. Enjoying sunlight, exercise and curious about the world around him, “V” looks forward to these walking tours of the area, fascinated by everything he sees and everyone he meets." It makes me think that there is a patent on the successful designs seen elsewhere, that this is Disney's work-around. It is distressing! They should've just put the thing on a tricycle. It would've been more realistic. Yeesh, I'm all abut suspending dis-belief, but I know Disney could have done a little better than that. It might be pretty cool if it was in an indoor area with black light effects like the Little Mermaid puppets, but it just doesn't look good. It's movement isn't too great either. It looks like a dog walking with a piece of tape on its paw. Just so the video doesn't get overlooked..